You are producing an event that limits you in both space and power, and you need to meet the demands of an economical bottom line. 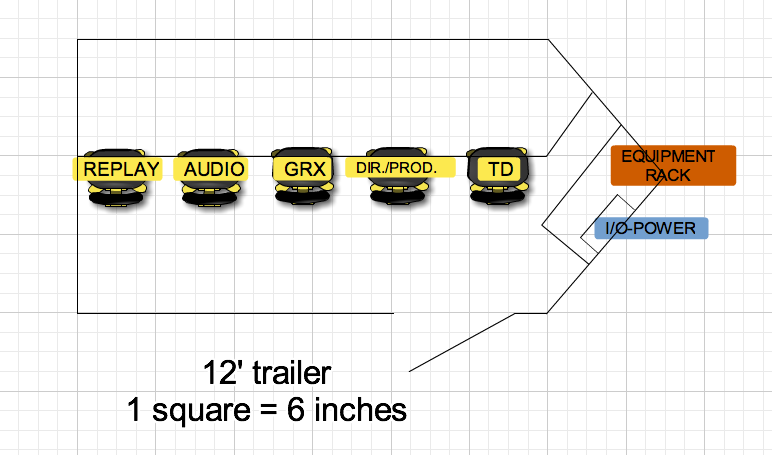 Narrow Path Productions' 12 foot mobile HD production trailer meets those demands, packing the punch of larger trailers into a smaller footprint, while reducing on-site power requirements. Accommodating up to 5 'flex' positions under a higher than normal trailer clearance (7 feet), this unit provides plenty of comfort for your crew. The accompanying B-Unit houses an additional space for both audio and video control. Available in either TriCaster or ATEM switcher configurations, 6 channel replay, digital audio board, video control and either Chyron or XPression-based graphics platforms.